Already in 1951 Marion King Hubbert predicted oil would face a production peak in the US, following thirty years after the discovery peak. (Deffeyes, 2005) This model was later expanded to the rest of the world. Between 2008 and 2013 importing electricity cost Belgium 1,8 billion €*, apart from the 10 billion € we imported in gas, coal and oil… (Holslag, 2014). Making Belgium 77,5% energy dependent. Only Cyprus, Malta and Luxemburg exceed this (Eurostat, 2015). Not only does that make us vulnerable for price shocks (and peak oil). This import is a euphemism for cash drain. Straight from the average consumer through energy prices, and indirectly through taxes to all levels of government. Paying an annual energy cheque somewhere between 1500 € and 2000 €. With a monthly average income of 3414 € she makes about 40.000 € a year for 250 days of labour. In other words the average Belgian works about 9 to 12 days for foreign companies or regimes we know mainly by reputation. For the lowest 10 income percentile this grows to 14 to 18 days. A solid question to answer is if we manage ourselves through oil rehab, do we want to wake up in a corporate Huxley’s ‘Brave New World’ or in an autonomous and resilient society. If your answer is the latter option, energy dependency should be central in this whole transition. Wouldn’t it be an absolute waste if this momentum would only lead from working for petro-authoritarian regimes into working for multinationals? Two questions remain. Do we still have the luxury to make the transition without the clustered financial and intellectual capital of multinationals? And if this deadline day approach of procrastinating multinationals wasn’t a deliberate gambling strategy with the energy monopoly of the next century at stake. How to combine (neo-)liberal market mechanisms and property rights with a more collective resource nationalism that naturally results from territorial authority, should be the real debate. Who owns the land? For centuries this simply was the one planting a flag and claiming ‘terra nullius’. Everything that lived, laid on or in the ground, or flew became personal possession. King Leopold II of Belgium’s claim over the Congo might be one of the most extreme examples. Property law is older than environmental-, building-, climate laws. Questions like who owns a landscape, sun, rain or wind were never raised – before Mr. Burns blocked the sun from Springfield to increase profits of his nuclear power plant in S6E25 ‘Who shot Mr Burns. Ep 1’ of The Simpsons (1995). In the real world this issue popped up with the Bolivian government approved ‘Law 2029’ in 2000. This privatised the whole water supply,(including the captation of rain or natural wells) giving a monopoly to Aguas del Tunari in an attempt to modernize the water infrastructure (and guarantee clear water for all Bolivians) in a state that lacked the means to do so. (Chan, Kahn, Cherish, & Vetere, 2007). Up until the Industrial Revolution virtually all energy was local (wind, biomass, with some turf and coal on the side). Between 1895 and 1932 there were about 6000 energy cooperatives in Germany. Fossil fuels, the political context and electricity changed this. Production and distribution were centralized, creating a new mass product and the birth of the consumer. Small scale cooperatives only survived in remote rural areas where it was just unprofitable to connect to a greater grid (Vansintjan, 2015). If the individual demand is smaller that the collective cost coverage nobody will want to pay for the total internalized cost of use, investment (education, production, distribution infrastructure) and insurance (like it is the case with nuclear power) – making any transition economically impossible. If the state decides about a transition, the government can alter the economic cost/benefit balance (through taxation or funding) or nationalize it as a public service. In this decision independence, involvement and even individual identity will always be put in the balance between solidarity and benefits of scale in a collective cost-benefit-analysis (including long term availability and sustainability). Of course this accounts only for theoretical, perfect lab conditions. Not in Eeklo. 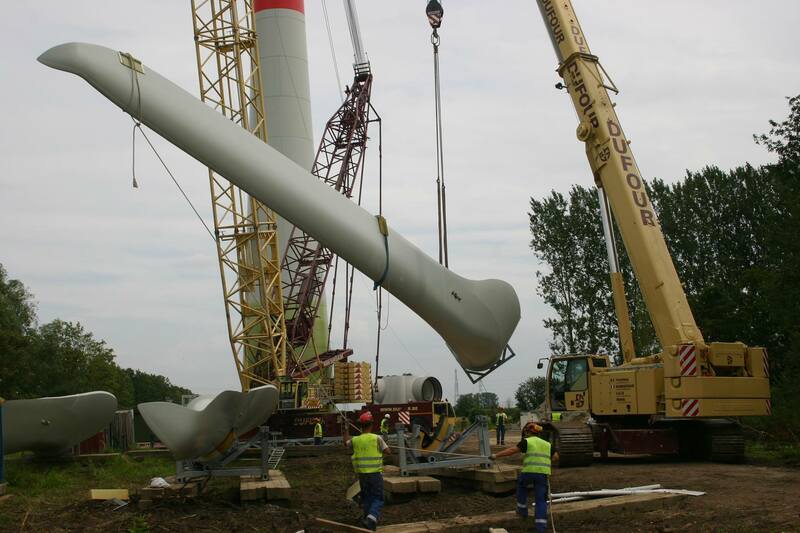 Between 2000 and 2002 the city only received one complaint against the construction of the first four turbines. In the following ten years, another four were permitted without any complaint or legal procedure. Already now Eeklo is the city with the highest turbine density (per capita) while having the biggest support for wind energy. The mental switch of not only consuming the energy but also owning the means of production had not missed its effect. Through the approach of direct participation people became more aware of their consumption patterns and this alone lead to a 50% drop of energy usage. It also leads to a more positive perception of the landscape if you look at a windmill that you own. In 2014 the conclusions of this pioneering approach were formalized in a vision text approved by the full city council stating all new turbines should be 50% cooperative, that the city would invest 5000 € per year per turbine in landscaping and investing the same amount in annually recurring energy reduction programs. Rather than one big bag of money the choice was very conveniently made for a sustainable involvement, dialogue and public recognition. This vision was put into practice in a special spatial planning initiative allowing 14 new turbines on top of the already existing 8. Some complaints were filed but none took the step of appealing this decision. Eeklo will hereby not only be the first Belgian self-sufficient elektricity city from 2018 on, but also have the highest cooperative market share. The non-financial benefit of the energy consultant can’t possibly be downplayed. Maybe the least visible part of the package deal with the city was to explore and guide new projects in order to meet our full energy potential. Definitely the biggest is setting up a district heating system. A study ‘Samsö in Eeklö’ showed the potential of heating more than all houses with the 70% low caloric left-over heat that a plant blows in the air after primal energy recuperation – n energy equivalent of 10.000.000 m³ natural gas. Saving up to 32.000 tons CO2 each year saves as much as not driving a diesel car 3400 times around the world covering 28% of the total carbon footprint of the whole city. Consider that the total cash drain caused by gas bills/import exceeds 40 million € (more than the total budget of the city). Two big problems stood in the way. A political and institutional one and a practical financial and legal one. The first is rooted in the fact that the waste plant is owned by 19 different municipalities while the benefits of the now lost heat would only go to one. Through suddenly adding value to something that until recent was blown out of the chimney, everybody wants to chip in. This was bypassed by the idea that the city could also build a decentralized bidirectional district heating system (later more) without the waste plant. And every single citizen would be allowed to add heat to the network from solar, earth or other, smaller recuperation installations (of course this was not totally economically true:)). Still it solved the deadlock. But not the latter practical, legal and financial problem. With costs between 750.000 € and 1.000.000 € per kilometer the city had no intention of paying for it themselves. And investments are so big, chances are little that even if we could find one provider this firm would have a monopoly which would make any concession very vulnerable both to European free market law and a regional law stating people should be free to chose their energy provider. Only what company would risk such an investment without any guarantee of customers? And like in wind any law or decree shaping this rapidly evolving industry is absent. This is a limiting factor for district heating systems in Belgium and makes them lose out compared to historical ones and bigger urban developments (where the ground is still private and complicated free market laws donot apply). 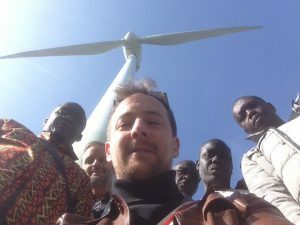 After creating our own legal framework one partner met all our criteria (cooperative price, fighting energy poverty, total energy shift from grey to green, …) and the negotiations over the extend of the given monopoly position started. Could, should, must the government force people to connect when the grid passes by? Once a concession is given by an open and public market demand one could argue collective climate goals ‘overrule’ personal wishes… But then the company could have easily abused its monopolist position by price setting, covering only dense and thereby profitable areas. On the other hand it also shouldn’t be that even the most remote farms are given communal grid solutions. The difficulty here is to find a balance between what the community provides and individual responsibility. How to take fast evolving off-grid solutions into account? They are making households resilient on one hand but also raise network and distribution costs for people that can’t afford to go off grid. Combining the evolution to a zero-waste, cradle to cradle society and off-grid solutions have let to the concept of rethinking district heating which is now constructed around one centralized big power source in a one-to-many system. Off-gridders would be connected in a decentralized and bi-directional cooperative grid. In this sense not only profits are distributed among the cooperant but (sustainable) power sources are optimized and consumers fully become producers too. Producers can remain off-grid if they want, but can also add heat to a larger grid when their need is fulfilled. This creates a different economic framework for (sustainable) power sources as it increases the return of investment of sustainables complementary to current recuperation possibilities and speeds up the pay-off period for fossils fuels and the transition without subsidies. New techniques are revolutionizing the energy landscape. Divestment from fossil fuels enables both a revival of old and almost forgotten methods as well as it opens a totally new range of possibilities. From the old system of watermills inside our water supply within households, over harvesting wave-energy, a thousand and one methods of photovoltaics to to ultra modern Tesla batteries. But more than openness towards these a flexible but bigger legal framework is needed. Simply because what is profitable and what is not is also in transition. So we need more than a law or decree. But a global energy pact defining what is common, covering basic needs on one hand. But also leaving enough opening (and perhaps even state withdrawal) for individual responsibility, creativity and entrepreneurial citizens or groups to organize themselves. Maybe one could even consider free state conditions leaving room for experimental start-ups. The debate about defining and limiting commons is the most fundamental democratic one can have. Only then followed by who and how they are controlled. *Netto elektriciteitsimport 362 miljoen € + Nederlandse en Franse bedrijven die 760 miljoen € + 678 miljoen € gas – en steenkool die als brandstof dienen voor de kool-en gascentrales. Adriaen, D. (2017, 3 31). EANDIS hengelt naar warmtenetten gemeenten. De Tijd. Bardi, U. (2009). Peak Oil: the four stages of an idea. Energy, 4. Clerix, K. (2015, september 29). Windkracht in Vlaanderen: zoveel kost een windmolen en zoveel brengt hij op. MO*. Deffeyes, K. (2005). Beyond oil: the view of Hubberts peak. New York: Hill and Wang. FOD Economie. (2016). De Belgische lonen in kaart gebracht. Brussel: FOD Economie. Grootte, D., Pepermans, & Verboven. (2016). Het Vlaamse subsidiebeleid voor zonnepanelen. (p. 5). KULeuven. Hirsch, R., Bezdek, R., & Wendling, R. (2005). Peaking of world oil production. Holslag, J. (2014, 12 22). Als we voor onze energie naar het buitenland blijven kijken zal België een investeringsslaafje blijven. De Standaard. Hopkins, R. (2009). Het Transitie handboek: van olie-afhankelijkheid naar lokale veerkracht. Utrecht: Uitgeverij Jan van Arkel. Jansen, J. (2015, februari). Gemeenschapsparticipatie in windenergie: een antwoord op de groeiende tegenstand. OIKOS, p. 11. OVAM. (2016). Monitoren van de doelstelling om 15% minder restafval te produceren in Vlaanderen. Brussel: OVAM. Slangen, N. (2016, 10 15). Hoe uw energiefactuur een slinkse belastingsbrief werd. De Standaard. Vansintjan, D. (2015). The energy transition to energy democracy. Herent: Acco. Verbanck, E. (2010, november). De laatste energiecrisis: betekent piekolie het einde van de Homo petroliensis. Mo Paper, p. 33. Waalse Regering. (2013, Februari 21). Cadre de référence pour l’implemention d’éoliennes en region Wallon. Wallonië. Waters, C. (2016). The Antropocene is functionaly and strategraphically different from the Holocene. Science, 12. Tagged Belgium. Bookmark the permalink.